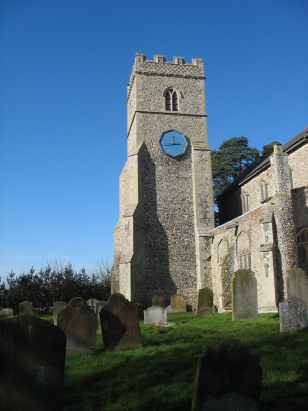 The parish of West Bradenham lies in central Norfolk about 6 miles south-west of the market town of East Dereham and 3 miles south of the main A47 east-west road that links Norwich, through East Dereham, to King's Lynn. Nowadays there is no separate East & West Bradenham, the Ordnance Survey shows a single village of Bradenham with the two parish churches at either ends of the settlement. The village grew up in the headwaters of the River Wissey, mostly along the lane which links Necton to Shipdham. St Andrew's church sits adjacent to the lane on the north bank of the Wissey. 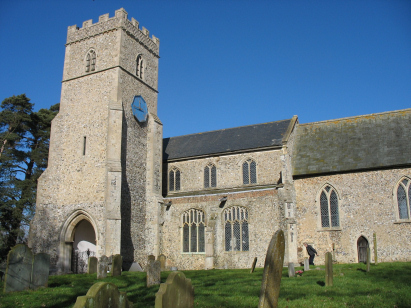 The church is relatively early for Norfolk with much that is of the Decorated style and dates mainly from the late 13th and early 14th centuries. Given that the church served just half of a normal village community it is large with substantial arcades bordering the normal nave and chancel. To the north of the church sits West Bradenham Hall and it may be hat this estate is the reason for the two parishes and churches in the village. A single standard 800-entry covers the period of the project and runs to just beyond as it finishes in 1881. This register is filmed on Microfiche 7 & 8 in the collection of the Norfolk Record Office and from which this transcript was prepared. The fiche are relatively elderly and not of brilliant quality, however the standard of preservation of the original register must be very good as this was a straightforward transcript to prepare despite the limitations of the fiche.